I finally get time to sort out my memories of Cambodia and Vietnam. Two weeks passed away, it is still so vivid. Many Chinese only know Angkor Wat, but not know Siem Reap. 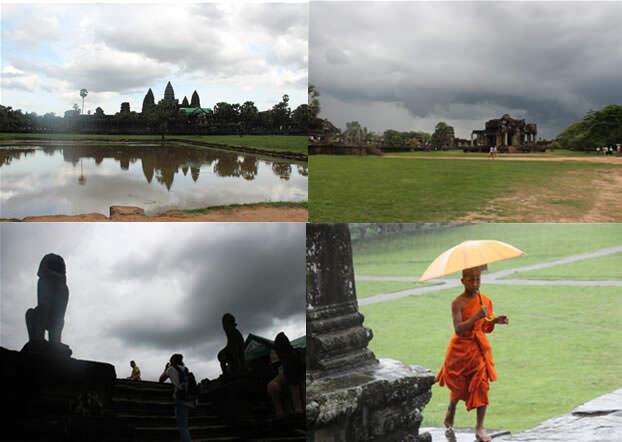 Same to me: before planning the tour, I didn’t know where Siem Reap was. Departing from Guilin, we need to connect flight at Guangzhou. I was told that it would take more 30 minutes to get to the international departure from the internal arrival, and I was prepared for that. The surprise was that there are free cable cars waiting to transfer us. Due to a thunder-shower, our flight was delayed by one hour.  Such situation is quite usual in July, the rainy season of both China and many other Asian countries. When we got out of the airport, our guide was just there. In his hand is a paper with our names. You know the feeling when you see some familiar thing, such as your name, at a strange place. We were transferred to the hotel to leave luggage, and then treated a typical Cambodia style BBQ. It is the first time I saw such special BBQ. The special dinner drove the travel fatigue from us. After it, we returned to the hotel and got the chance to view it carefully. It’s named Angkor Tara (Tara means star). I liked this hotel because of the lotus flowers which were used for decoration. As a 4-star hotel, it matches the standard. I had a not-bad sleep at the first night out of China. Do you know what it is in the cup? It is the stem of lemongrass; and the tea is lemongrass tea. Before leaving for the tour, I prepared some lemongrass oil with me to prevent mosquito. Before visiting them, I always thought that Angkor Wat was a part of Angkor Thom. It was wrong. After you see, you will know. We hadn’t chance to see the sunrise. In the early morning, it was cloudy; when the cloud is gone, the sun was already very high. We visited the Angkor Thom in the sunny morning. It was too hot to be outside at noon! After lunch, we were sent back to the hotel to have a short break before go to the Angkor Wat. When we left the hotel for Angkor Wat, the sky started getting cloud as well, much cooler and more comfortable than morning. We also missed the sunset, but witness a heavy shower with thunder and lighting in the old temple. It is worth much more time to listen to the rapid changeable history in the rapid changeable nature. We spend almost one hour just in the front of the above wall. When we were dropped at the Old Quarter to start our own exploration to local market and Pub Street, it is about 5:00 PM. We tried a find a Chinese restaurant, but failed. Everywhere are café bars western restaurants, so we could only do Rome as Rome does, and finally chose Pizza. 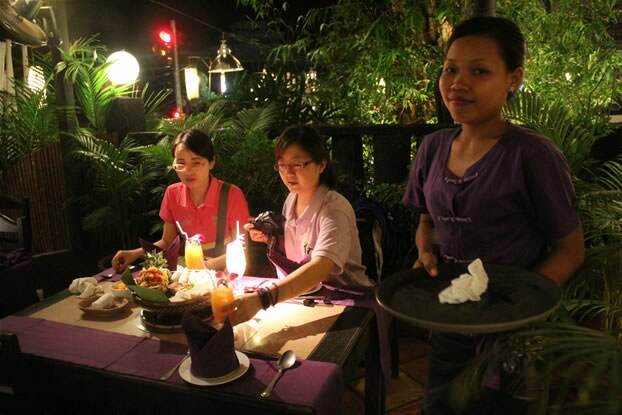 It is said that Angelina Jolie had been to that restaurant, when she was in Siem Reap for Tomb Raider. The dinner was not as expensive as we thought. It was a great comfort! After the dinner, we headed to the busy well-lit night market. There are countless shops! Shopping is always irresistible to woman. Though we were from China, which produces the best silk in the world, we bought several silk scarfs. And they seemed not true silk. Beside of the scarf, we also met a free local opera at the center of the market. It told a story of three young boys pursue three beautiful girls. Wherever it is, love is always the eternal theme. It was almost 11:00 PM when we return hotel by Tuk Tuk. It cost each of us one dollar. Yesterday is a historical day; today is daily day. We visited the Khmer Village after breakfast, by Oxcart. 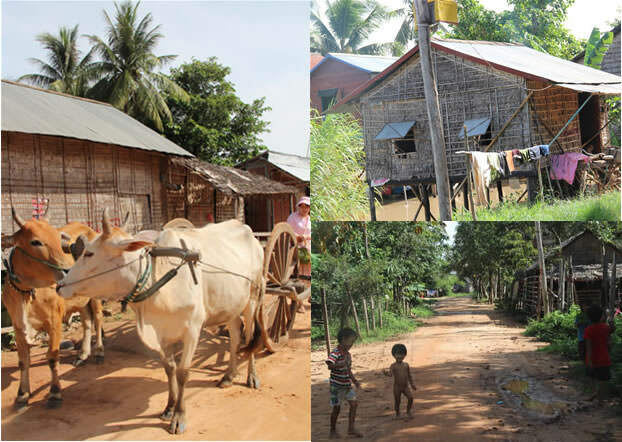 This is a common village in Cambodia, with rough earth road, wooden houses over a dirty river. However, most people are with happy faces. 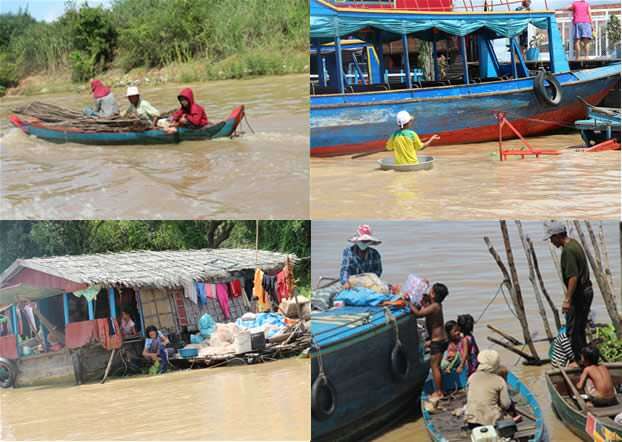 When we returned the car and headed to Tonle Sap Lake, we talked about the problem of the poor and rich with our guide. 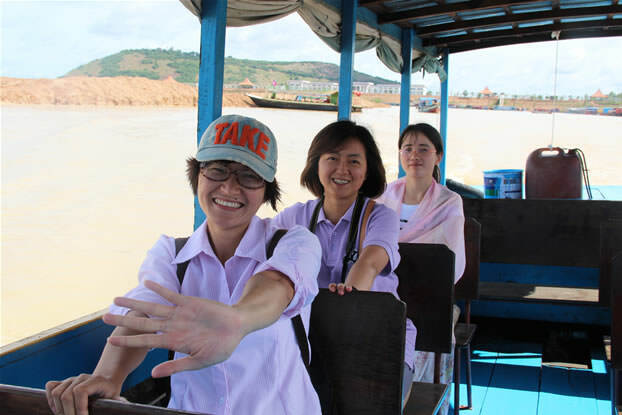 The guide told us in Cambodia, most rich people are Cambodian Chinese and officials. Most Cambodian Chinese are business men, they do work very hard, so they are rich; officials are also very rich, but nobody knows why. We truly understood that! It is the mother lake of Cambodian, also the biggest lake in Asia. When you are far from the bank, you may feel that you are on a sea. This lake nourishes five countries around it. The water is quite muddy in the July, rainy season. It is said that in the dry season, it will be green and more beautiful. 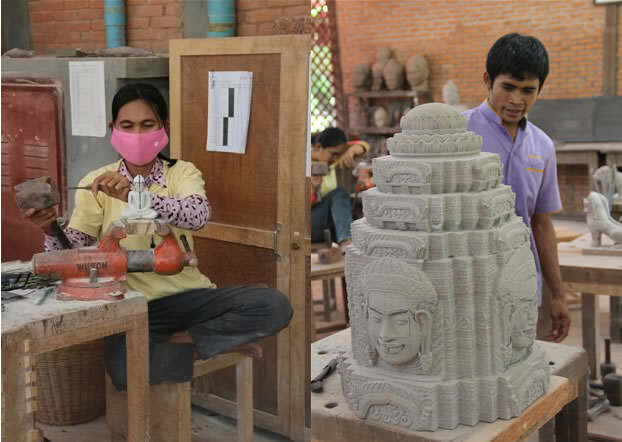 Our last stop in Siem Reap is a handicraft factory. It is a shopping place, but not a boring place. It is also a good way to learn about this country and the people. After lunch and a short break, we headed to the airport and said goodbye to Cambodia. By the way, Angkor Airport is small but beautiful. Its owner is a Frenchman and he rented this place as an airport for 90 years. In Cambodia, there are many things with French owners, including the restaurants where we had today’s lunch. Our guide told us about that. When we pass the custom again to depart Cambodia, the customer officer again muttered: Qian (Money), Qian…Meijin (USD), Meijin. This time I insisted on pretending to not understand, even when he took up RMB10 to show me. He finally let me pass though it took a little more time. Now, we really ended our tour to Siem Reap. Except for the food (we need more time to adapt it), I like this tiny and friendly city. Maybe one day, I can spend more time to walk on the countryside road, to savor the hidden peace more carefully. In the front, Saigon was waiting for us! "Strolling around these two historic colonial towns with churches, squares, and ancestral houses, you would travel back to Portuguese and Dutch periods or even British era. They are gorgeous, the real gems." "It was fantastic - we shopped at a local market, learned to identify local ingredients and cooked stir-fried cashew chicken, Tom Yum Gung (iconic Thai soup), spring rolls and curry soup. The best thing is now I get to make these dishes at home and the food keeps my special moments in Chiang Mai on the tip of tongue…"